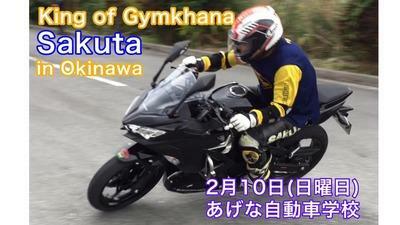 This weekend 2/9 ~ 10 I will participate in Okinawa Moto Gymkhana. . The motorcycle that I’m using is a Ninja 400 prepared by Bike shop “Okinawa Autoban” who is hosting this event every year. This vehicle is the same type vehicle that I rode at the end of last year, but with an upright handle for suited for gymkhana. This time I’m using a loaned vehicle so I hope that I can draw out the potential of this bike, how good can I win with it? I would like to have fun.